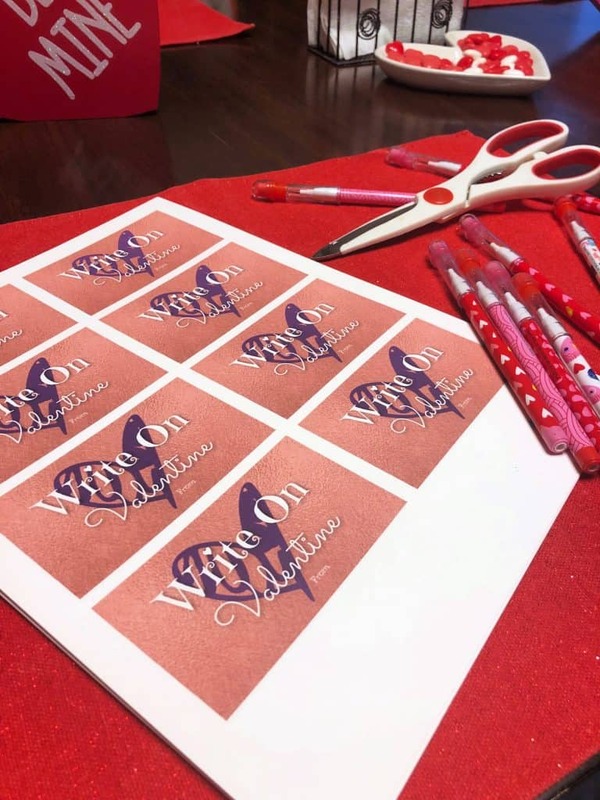 “Write On” Valentine with Free Printable & Tutorial! Valentine’s Day is just around the corner and candy free Valentine’s class treats are always a huge hit. 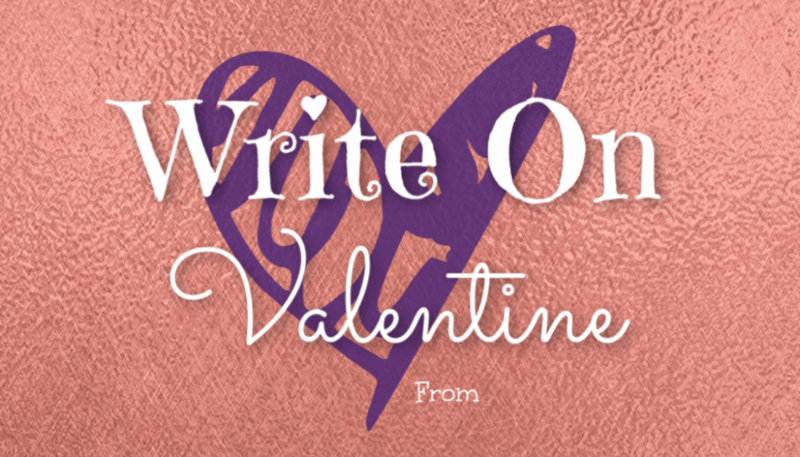 Grab this Write On Valentine printable and tutorial below. My kids are in kindergarten and 3rd grade now. Writing is a BIG component of their lives and my son informed me that having cool pencils is really important. That made this years candy free Valentine a super easy choice. 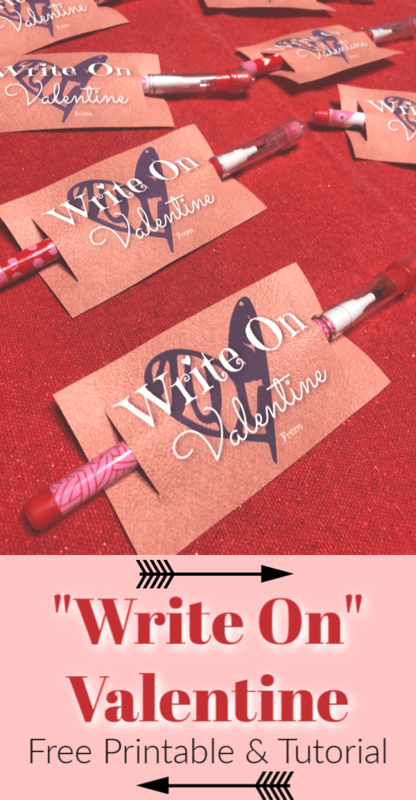 Check out this simple “Write On” Valentine tutorial and free printable! No seriously, get it. It is free and you can print off the PDF with 8 business card sized copies on it and get to work. Print them on cardstock, have your kids write their names on them and start assembling. You can click on the image below to print them too! 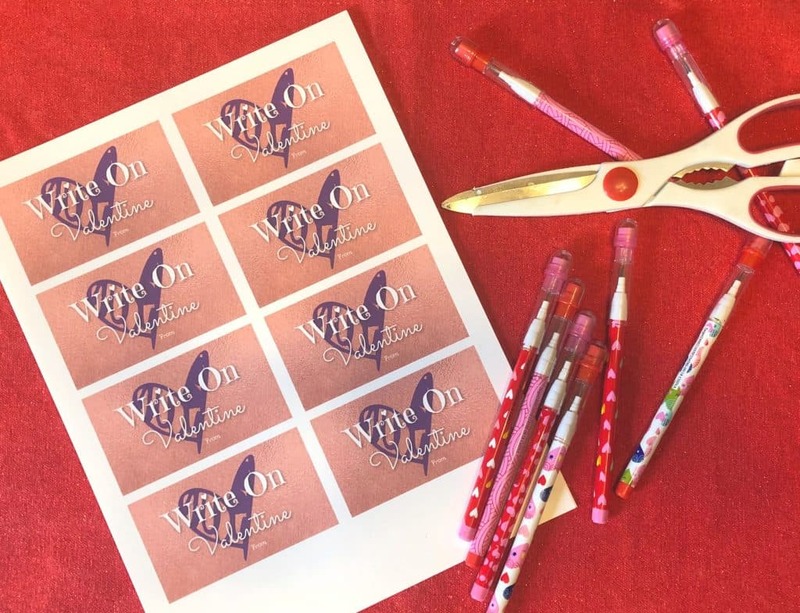 I love printable class party treats for so many reasons. 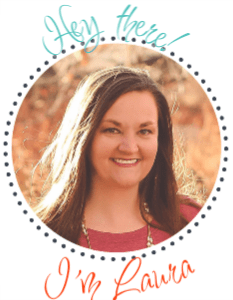 One of the big reasons is that they are pretty easy to put together and usually I can get both of my children’s classes completed for under $10.00. I hit up the party supply or seasonal sections to find little sets of items that my kids like and then I get to work. 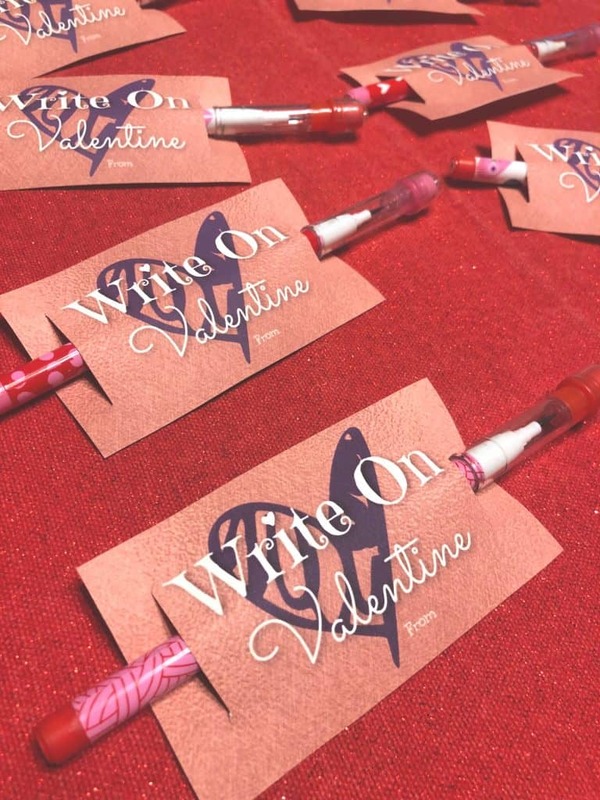 You would think that assembling these super cute Write On Valentine’s would take a lot of time. Not really. I was able to get 8 done in about 3 minutes. The part that takes the longest is the cutting out of the cards. You can also use a paper cutter and it goes even faster. 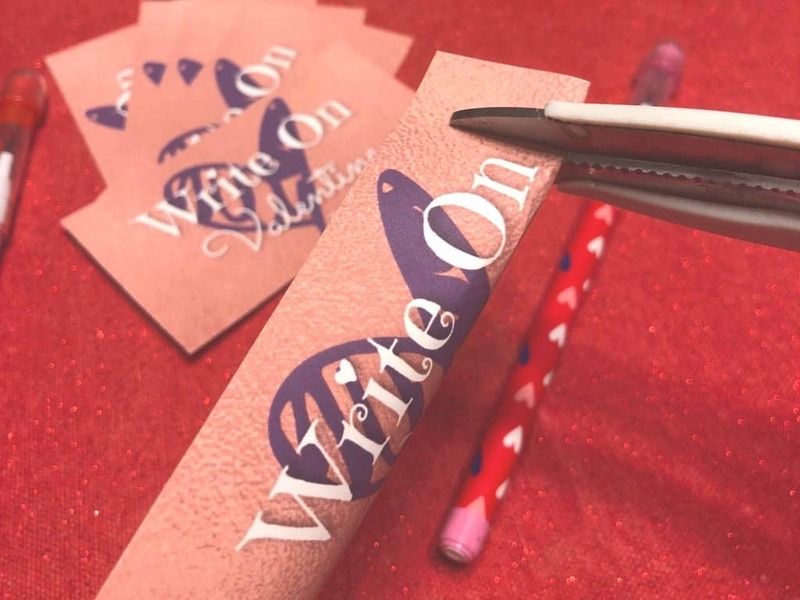 After you have the main cards cut out, fold the cards in half (do not need a hard crease) and then cut a slit on each side of the words. Finally, thread the pencils through the slits. You can also add a small piece of tape to secure them to the paper if you want. I will be doing that because, kids. Protip: have the kids write their name on the printed out sheets first, next to the “from” space, before you start cutting them out. Other than that, my kids are very excited to give these out to their classmates. 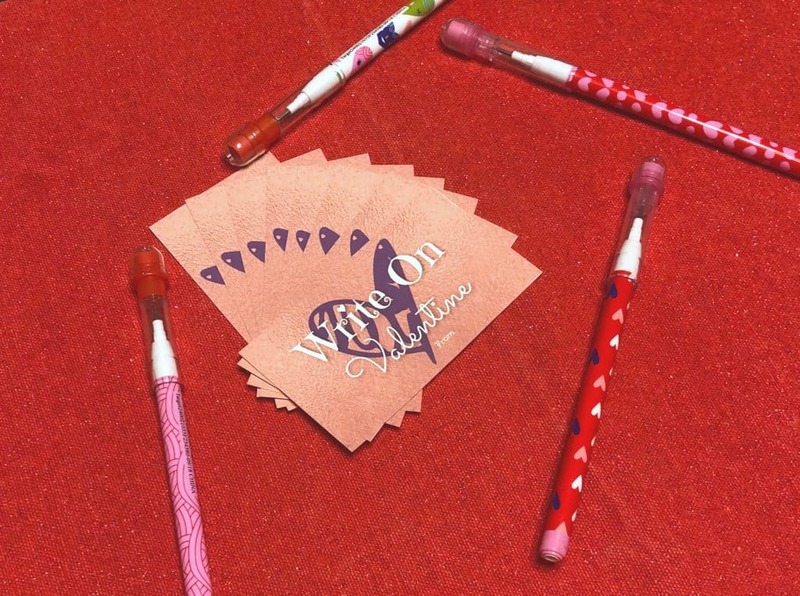 Oh and if you want some other candy free Valentine ideas, check out these bubbles, sunglasses, slinky’s and bookmarks! All useful and fun and super inexpensive too! This post contains Amazon links. Any purchases you make through them, could generate a small amount of revenue for me. Previous Post: « What’s Making Walter C. Laugh Giveaway!